I am really smitten by the knitting bug. I didn't realized how obsessive I was going to be about knitting wire after knitting Glorious in Purple wire dress last summer. Oh well, better than smoking or bad habits, right? 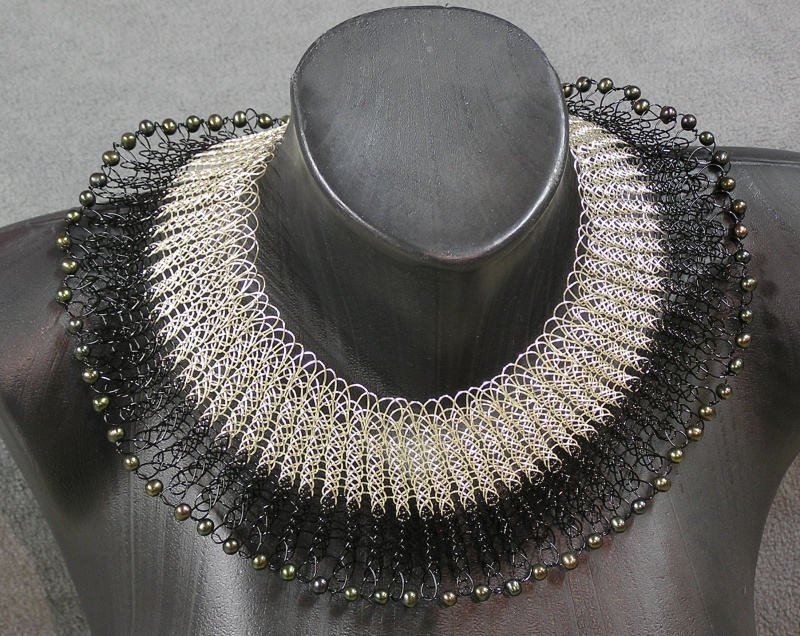 Now, most knitted wire is in a small tube or a narrow ( under 2") wide flat necklace or bracelet. I thought, if I knitted a giant tube, about 16" - 18" in diameter, I could cut it open and make it into a wide bib-like collar type necklace. I got two necklaces out of that giant tube, and this is the finished one. Silveplated copper wire with black copper wire border, finished with freshwater pearls and a vintage glass button for a closure. It is named Cleopatra Collar. The other necklace is unfinished for I am not quite sure how I want to finish the edges, but I found a lovely black jet Victorian button I will use as a closure. If you are curious on how long it takes, I started it in Dec, and finished it in 3 weeks, working a bit at a time.